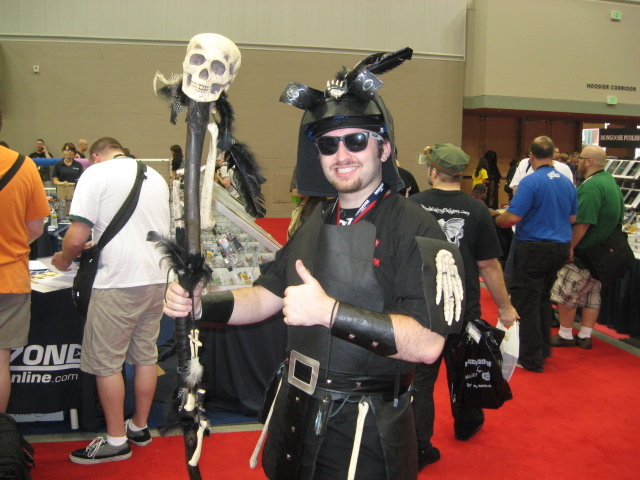 I come now to the end of my photographic tour of GenCon this year, the last few shots I took on Saturday and Sunday. Another pretty Elf wandered by. There is no real connection here. I just like pretty elves. An urban shaman/wizard also came by. I love the sunglasses as part of his costume. 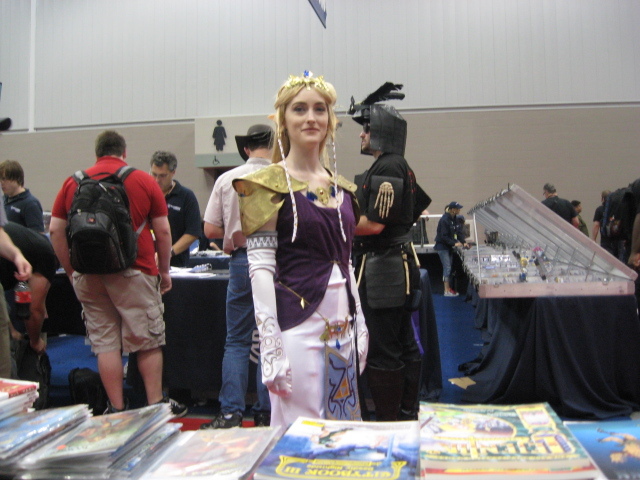 Cosplay is not just for the fem fans of the world. Guys get into it too, and they look good when they do. Back to pretty elves. 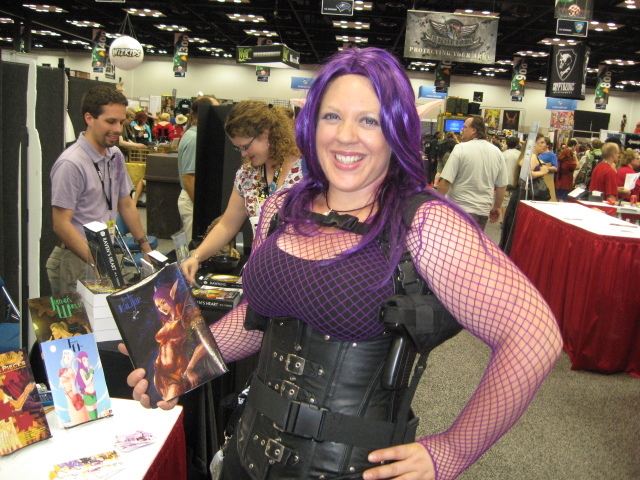 When I got away from the FBI booth, I wandered back to the authors area for some random socializing. Look at that lovely purple hair! On Saturday night James and I were invited to an Apples to Apples party and contest. Even though it meant Rick would have to make an extra trip into town to pick us up when the party was over, he agreed, and we went to it, in vague hopes of being champion players and walking off with prizes. 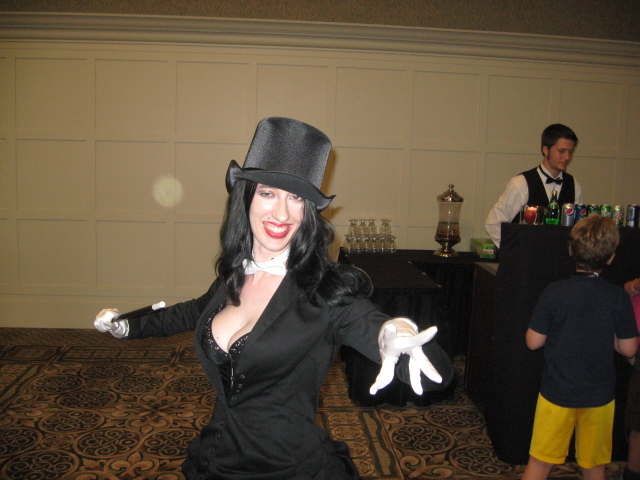 Zatanna was at the party. James and I got to sit at her table for the first round of Apples to Apples competition. I did pretty well in that round, getting 10 cards in 20 minutes. I did not do so well when I switched tables and competed against others in the two following rounds. 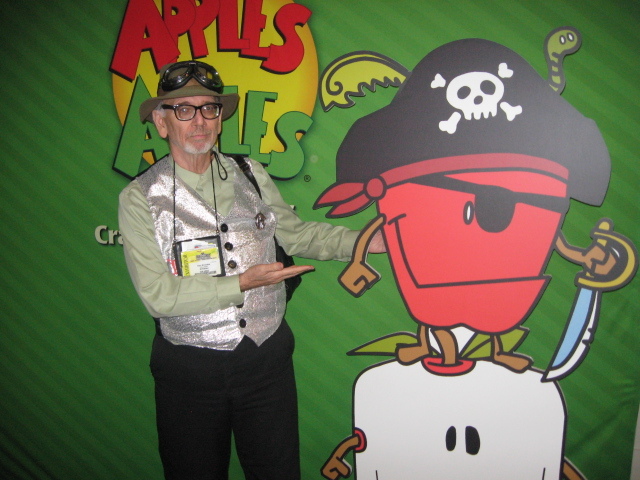 At the end of the party, I got my picture taken with my piratical Apple buddy. 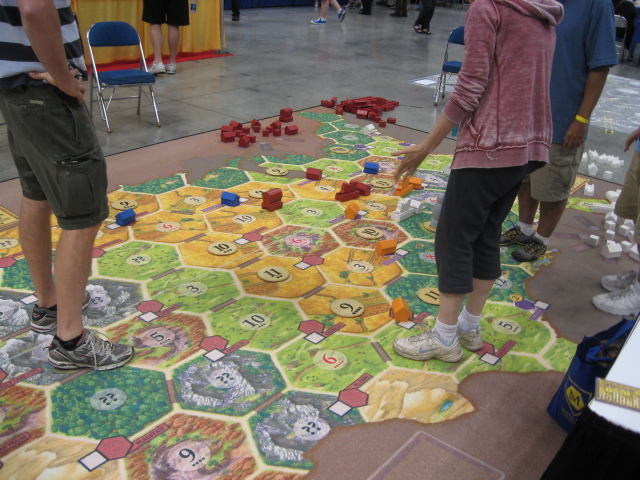 Later that evening we wandered into an open gaming area and found a giant-sized Catan game based on the U.S. map. On Sunday morning I ran my last T & T game. 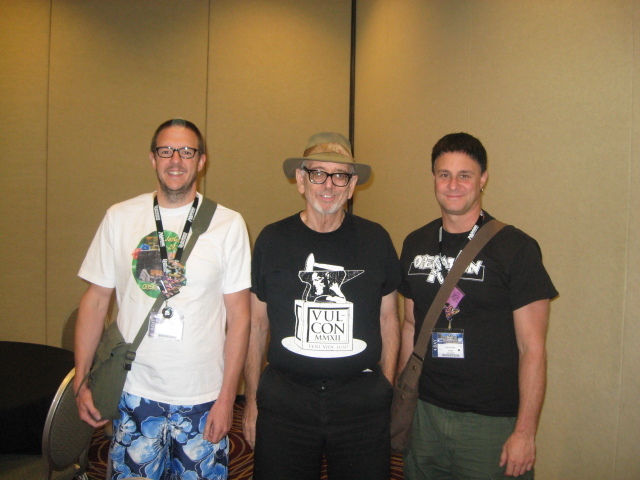 Afterwards I posed with Mike and Rob, brothers who were both in the game. Rob’s son Jacob was also there. 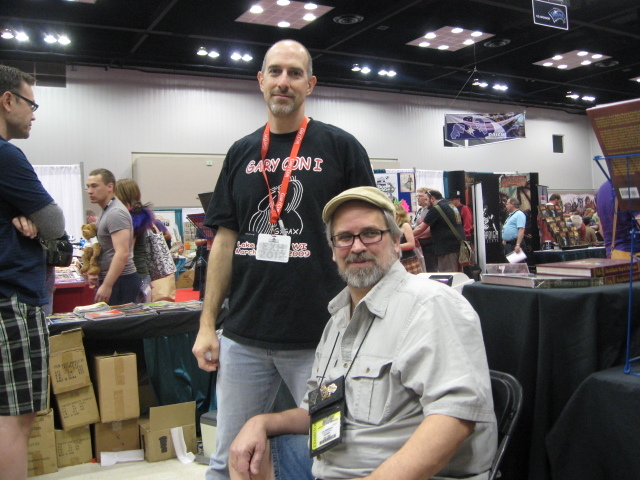 Back in the Exhibitors Hall and the authors area, I stopped to chat with Chris (C.V.) Marks–a fantasy author of the kind of stuff I like. She always hands out chocolate bars as a lure to bring people to her table, and I was hungry. 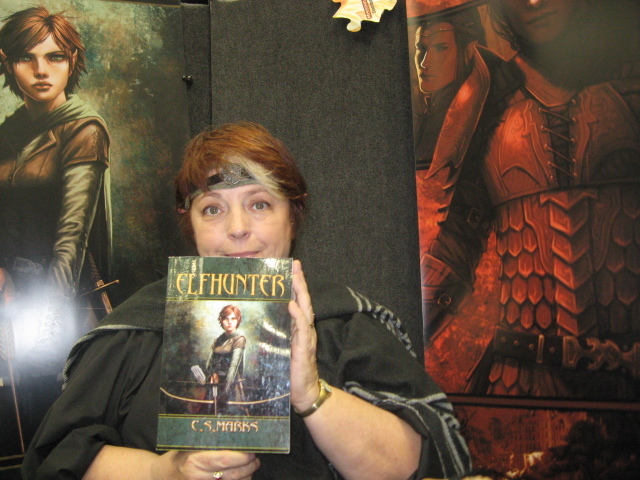 She lamented that she would have to carry her heavy pre-publication copies of her new Elfhunter novel away from the Con with her, so I asked for one, and made my Charisma saving roll. I promised to review the book afterwards. I’m currently reading it–about 6 chapters in, and it reads very well. Two pretty elven heroines are tracking down a monster. Look for a full review in a week or so when I get the book finished. My last stop of the con was at Kenzer and Co. where I got a chance to chat with my friends Dave Kenzer and Jolly Blackburn. Shortly after this picture was taken the Convention officially ended, the Hall closed, and we all packed up and went home. I had an invitation to go to Sunday night supper with Tom and Robin Loney and some friends from FASA, but I was really too tired to go back into town for one last crowded and expensive supper. Sorry, guys! 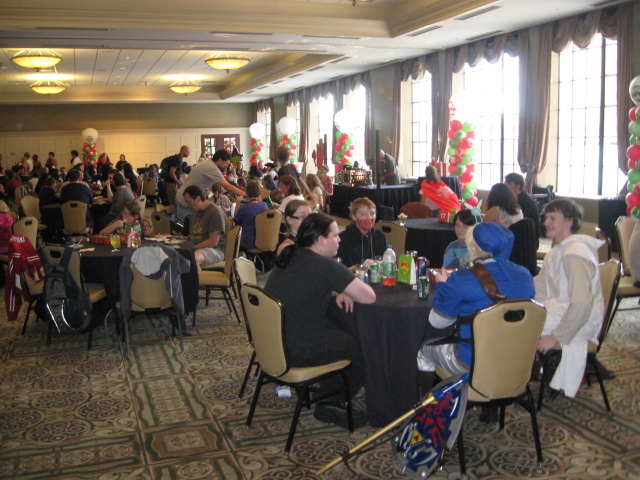 Anyone who wants to socialize with me at these cons has to do it before the last night. We flew home to Phoenix on Monday afternoon. I love flying west. We left Indianapolis at 6:15 and arrived in Phoenix at 6:55, even though we spend 3 hours in the air. That was all less than a week ago, as I write this now. I was really exhausted by it all, and it took me 3 days to recover and get back into my regular routine of posting things all over the internet. I don’t think there are any more big conventions in the schedule for me this year, but I have a small one–CopperCon 34 here in Avondale next week.